In Support Of New EP But Wait… There’s More! 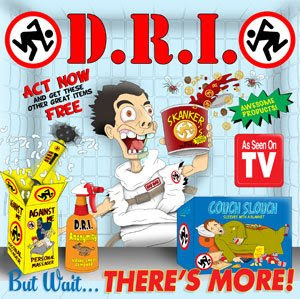 D.R.I. will release their new EP, But Wait… There’s More!, on June 10th, via Beer City Records. The 7" will be available on several different colors of vinyl (translucent: red, blue, gold , green and clear. White and black. All colors limited to 1000 pressed except black.) *Plus a special color (limited to only 1000 pressed) that you can only get from the band at their shows! The 12" will be custom, hand screen printed version limited to only 2000 copies pressed. The vinyl is actually screen printed. There are very few screen printed records out there due to the lengthly time and effort it takes! Besides the record looking very cool it will sound even better due to being on 12" and having wider grooves! You can preorder from the label’s online store HERE or your favorite record store. The CD will also be available on iTunes. For record stores it will be exclusively distributed wholesale throughout the world by ‘Independent Label Distribution’ (http://www.ildistro.com) and its partners.